Give this wooden cookbook holder to the chef in your life! Amish Furniture Factory's cookbook rack can be customized to suit their personal style. The pictured Ashton Printer Stand is built in rustic cherry with Seely stain. The pictured Boston Printer Stand is built in qs white oak with Tavern stain. A rustic home can always spare a corner for pure decorating. This twig cane stand has bent twigs accenting the sides, and is full of canes made of more twigs. What a unique handcrafted item to accent your entryway. Pictured in cherry with Asbury Brown stain. Pictured in pine in Buttermilk paint. Pictured in oak with FO-816 MV Special custom stain. Custom finishes need to be ordered by phone. Pictured in brown maple with FC228 Rich Tobacco stain and shown with Cappuccino one-piece cultured marble top. Customer will need to provide their own tops from a local cabinetry store. Pictured in brown maple with FC15743 Briar stain and shown with Juperano Gold Dark Granite top. Customer will need to provide their own tops from a local cabinetry store. Pictured in brown maple with FC10901 Golden Brown stain and shown with Cappuccino one-piece cultured marble top. Customer will need to provide their own tops from a local cabinetry store. 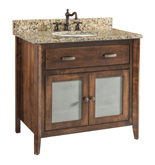 Pictured in brown maple with FC10748 Burnt Umber stain and shown with Juperano Gold Dark granite top. Customer will need to provide their own tops from a local cabinetry store. Keep your cups handy and get the most out of wooden design with a rustic cup holder. A rustic pine towel rack with log ends brings the country charm to your bathroom. 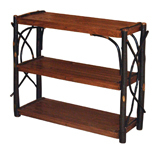 Curvy hickory twigs frame this elegant hardwood stand with slatted shelves and strong hickory legs. This slatted shelf is noticeably handcrafted with its rustic hickory legs and bent hickory designs on either end. Adorn your home with hickory. Bent hickory twigs frame the sides of this tall stand, giving it a handmade and rustic style. Slatted shelves ensure that this eclectic piece will get plenty of use in your home. Your kitchen will charm whoever sees the turned pegs of this simple wooden cup holder.